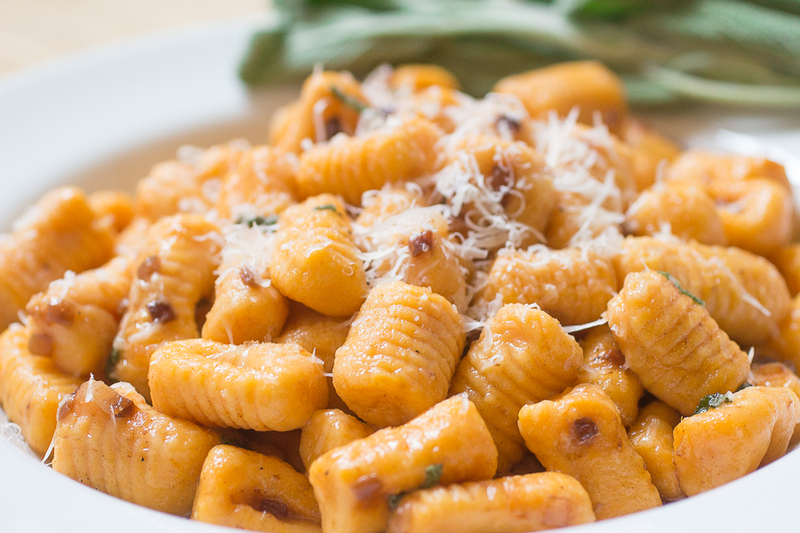 After making the gnocchi recipe multiple times at Taste Buds, I’ve been itching to make my version at home. Cooking with kids is incredibly satisfying, but it can be pretty frustrating, as well. Homemade Gnocchi requires a gentle touch and a whole lotta patience; two things most kids don’t have. Letting the kids take control of the recipe didn’t come naturally, at first. I was constantly fighting the urge to knead the dough for them, or scoop the cupcake batter myself to prevent the inevitable mess. But seeing their faces light up when they taste their creations, it becomes worth it. Kids don’t care if their gnocchi is tough or their cupcakes are dense. They made it with their own two hands and are proud of what they have accomplished. But regardless of how fulfilling it is to teach, I still end up with that “if I don’t make this myself and make it right soon, I might explode” feeling. So to detox from the rock hard gnocchi balls made by 4 year olds, I decided to make some at home. 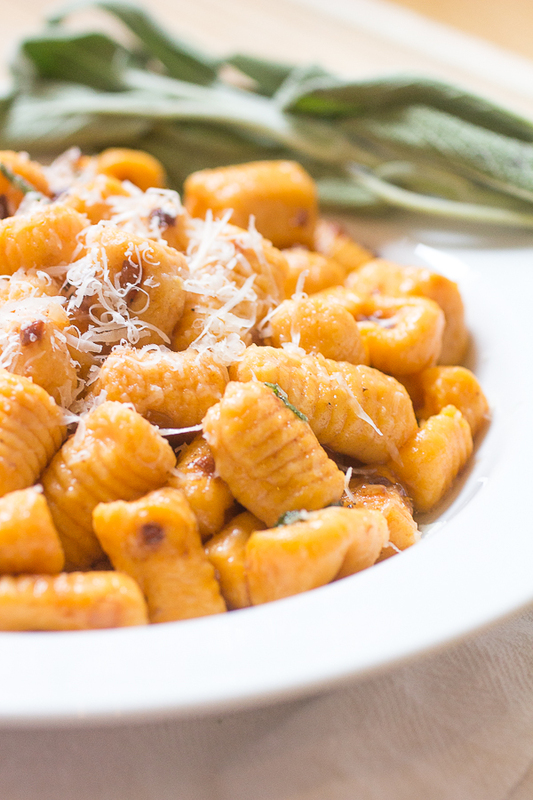 The key to perfect gnocchi is minimal flour. The less flour you use, the more pillow-y they will be. 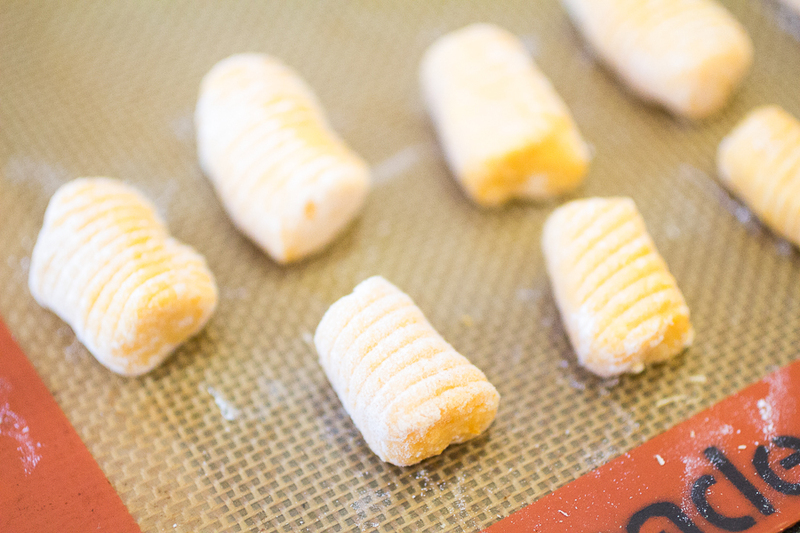 Once the gnocchi’s have their general shape, the amount of flour on the outside of each piece is not as important. Don’t be afraid to add more to the outside to prevent the pieces from sticking to the table, board/fork and each other. This flour will come off when the gnocchi’s are boiled. Remove the plastic wrap and cut the potato in half immediately to allow the steam to escape. Let the potato cool completely before continuing. Meanwhile, mix together the ricotta, olive oil and salt in a separate bowl. Scoop the cooked sweet potato from the skin, excluding any hard or over cooked parts. Pass through a potato ricer, food mill or sifter. 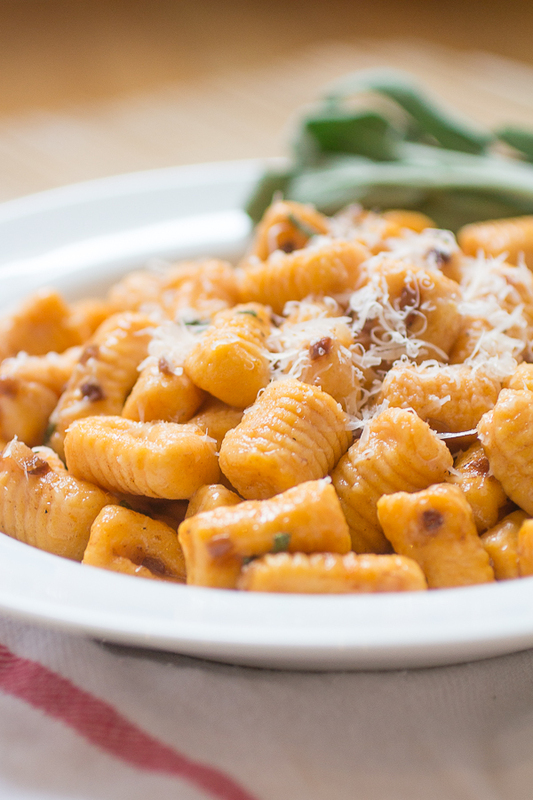 Create a well in the center of your gnocchi for the ricotta mixture. Lightly sift about ¼ cup of flour on top. 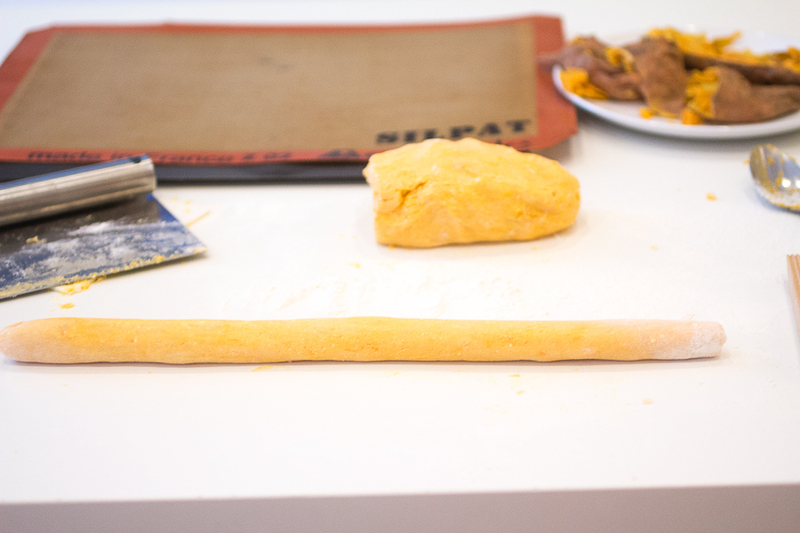 Using a bench scraper, gently fold and cut the mixture until almost incorporated. 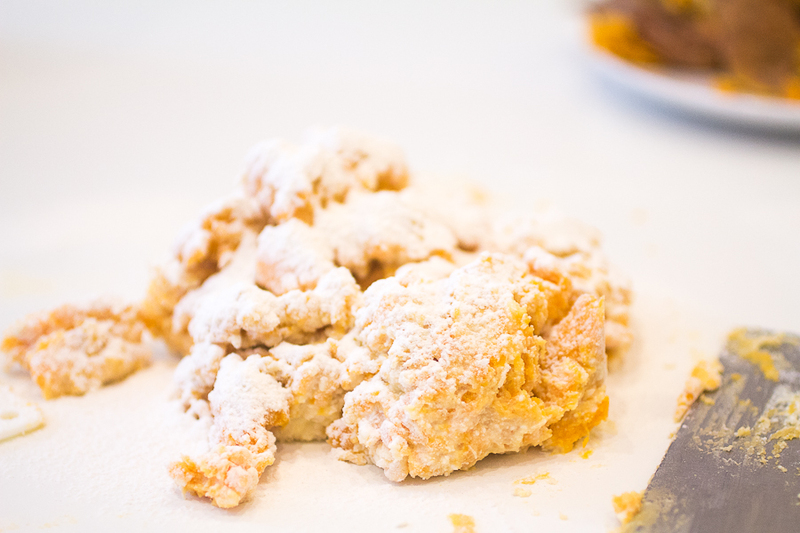 Add about ¼ cup more flour and fold until all of the ingredients are incorporated. Use your hands to press the dough into a ball. 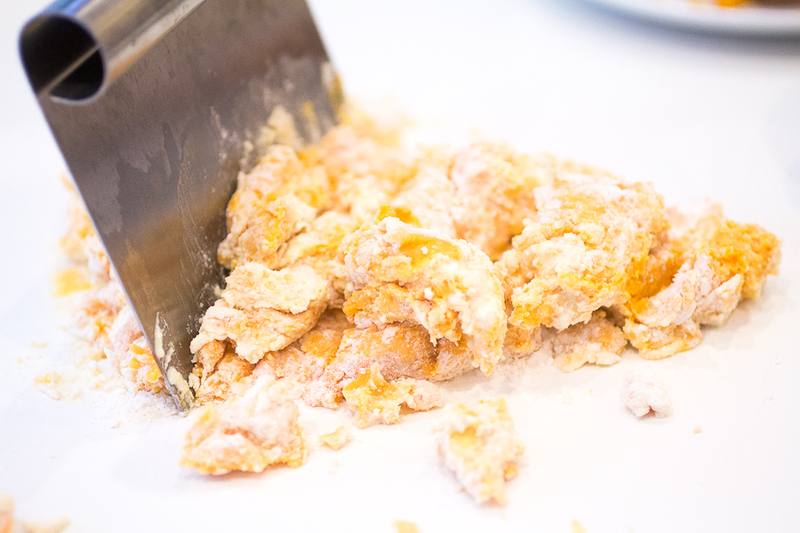 Scrape off any remaining dough from your counter or work surface and lightly dust with sifted flour. Cut the dough into 5 equal parts. Roll the dough into a thick snake and lightly dust with flour. 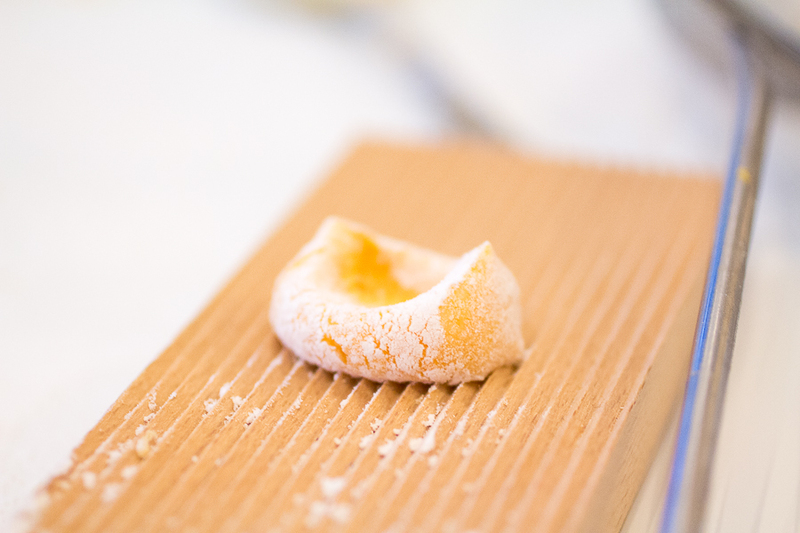 Using your bench scraper or knife, cut the dough into 2 inch pieces. 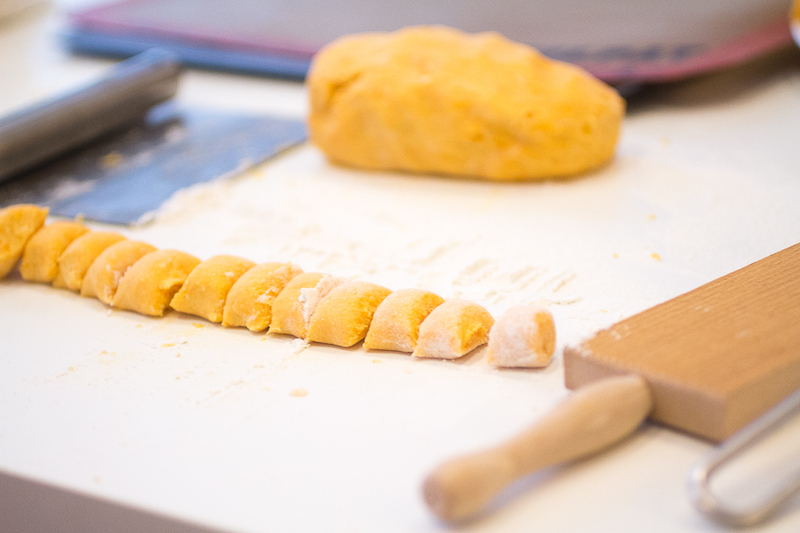 Roll each piece lightly in flour, and then place on your fork or gnocchi board. Gently press down in the center with you thumb and pull down in one sweeping motion. Bring about 5 cups of water to a gentle boil. Drop 2 - 3 dumplings in the water at a time. When the dumplings float, wait an additional 30 seconds and then remove with a slotted spoon. Place on a plate or tray lightly covered in olive oil. Add the butter and stir constantly until completely melted. As the butter begins to foam, pay close attention to the color. When the butter is lightly golden brown, turn off the heat and remove the pan. Add the lemon juice and sage immediately. The lemon juice will slow down the browning process. Gently add the gnocchi to the pan and toss until lightly glazed in sauce. Top with freshly grated parmesan cheese and serve! Hi Kari! That’s so exciting you are thinking about writing your own blog. I would definitely suggest starting out your first few months on a free platform first before committing to a paid option. Blogging is a huge time commitment and it’s actually a bit of a financial investment, as well. You want to make sure it’s right for you and if you have the time, energy and resources to write regularly. Otherwise, paying for a service might not be worth it. It took me 3 years before I made the switch, but I also haven’t regretted it since. If you do end up starting your blog and it’s something you are really passionate about, there are a lot of great services out there that can help you get started. I used Shay Bocks to help me transition from blogger to WordPress (which was another technical and financial bump in the road. I wish someone has suggested WordPress to me when I was getting started!). I also did what you are doing, which was reach out to blogger friends I knew with more experience. Without them, I would probably still be on blogger writing on my might-as-well-be-private cyber journal. So feel free to reach out to me with any questions. I’d be happy to help! Good luck! Oh, these look so perfect. I need a big bowl right now.